Don’t mind the roots! This is a simple hair style anyone can do with medium to long hair. of course a plain old boring pony tail will work on a homestead, why get pretty just to get gross? Well, even though I hang out with chickens and clean poop most days, I like to look as nice as can I can be! Doing this simple twist on a ponytail or bun is sure to give you a cute style that makes you feel good even when you are a chicken/turkey queen:D.
Grab a section of hair from the top of your ear to behind it and braid down. Secure with a small elastic. Pull rest of hair back into a bun or pony tail and secure with elastic. Take one piece of braided hair and pull over top of head, secure with a bobby pin on other side. 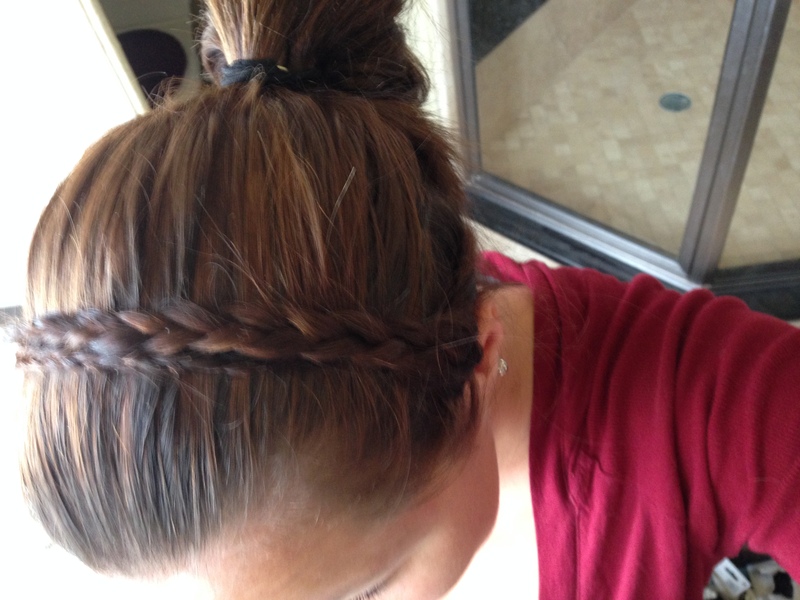 Do the same for the other braid, keeping it behind the first one you did. This makes it look wide and as if it were one piece. You can add bobby pins where you need them..I added one more b/c my braid on one side was not tight enough at the base and it popped out a bit. I just flattened it with the pin and it acts as an extra security measure.